أخطبوط – الشبكة الوظيفية تعلن عن الصورة الفائزة في مسابقة “سيلفي ومكتبي خلفي” لصاحبتيها ألاء أبو رزوق وفرح نصيف. وشارك في المسابقة مئات الباحثين عن عمل من جميع أنحاء الأردن، والذين حضروا معرض توظيف أخطبوط الخامس 2014 وقاموا بالتقاط صور (Selfies) لأنفسهم ولأصدقائهم عند كشك المسابقة خلال يومي معرض توظيف أخطبوط الخامس 2014 والذي عقد في 22 و 23 أكتوبر من هذا العام في عمّان، الأردن. وكانت صورة ألاء أبو رزوق وفرح نصيف واحدة من أصل 10 صور خلاقة والتي تأهلت لمرحلة التصويت بعد أن تم إختيارها من قبل لجنة تحكيم أخطبوط وتحميلها على صفحة أخطبوط على الفيس بوك. 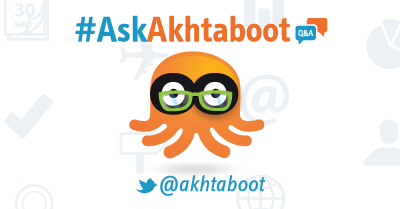 Akhtaboot is pleased to announce the launch of its Twitter campaign #AskAkhtaboot – to begin this coming Sunday, March 23rd, 2014. All Akhtaboot followers on Twitter will have the chance to ask all their career, interview, workplace questions and Akhtaboot will provide them with an expert answer right away. Mohammed Khlaifat was one of the 5 finalists whose creative tweets were posted on Akhtaboot website for people to ‘retweet’, and after receiving the highest number of retweets from members, friends and viewers, Mohammed was announced winner of #CompanyFix. 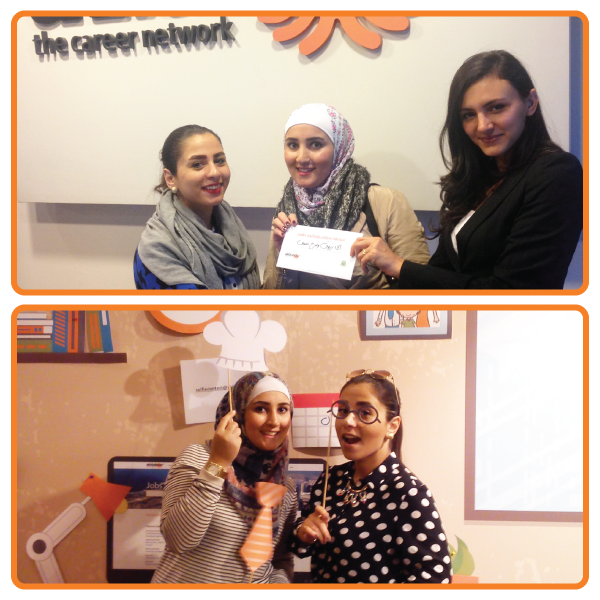 “We are happy to announce the winner of Akhtaboot’s Twitter competition, “#CompanyFix”. 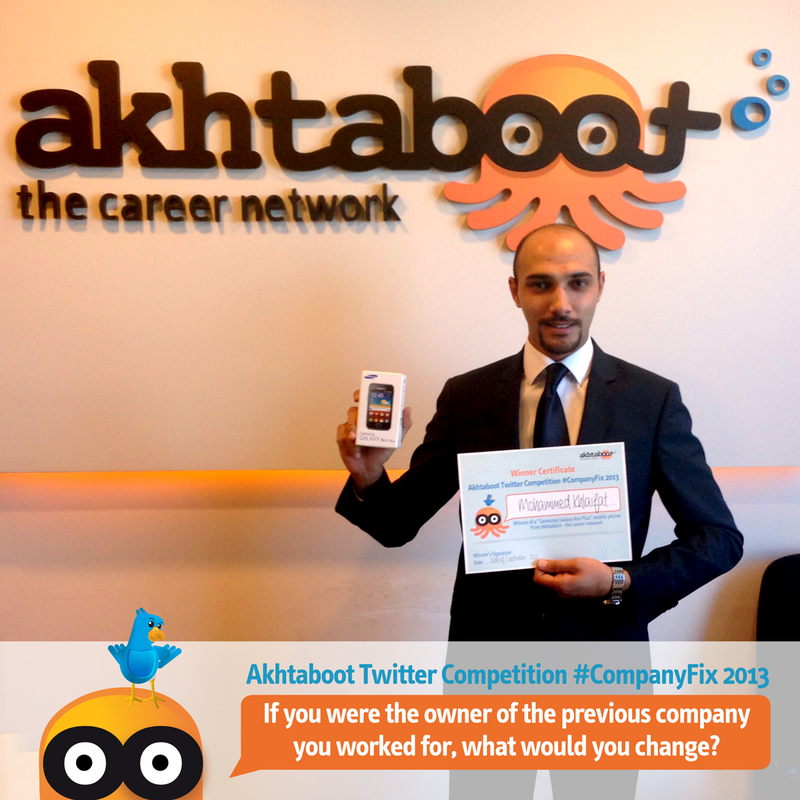 In its efforts to reward its loyal followers on Twitter, Akhtaboot – the career network announces the launch of its twitter competition 2013 – #CompanyFix – to begin today Sunday, August 18th, 2013. Participants can compete by tweeting their most creative answers to the question “If you were the owner of the previous company you worked for, what would you change?” within a period of 2 weeks (18/08/2013 – 31/08/2013). After this period, the 5 most creative answers will be chosen by Akhtaboot’s competition committee and placed on akhtaboot.com for people to retweet within 2 weeks (08/09/2013 – 21/09/2013). 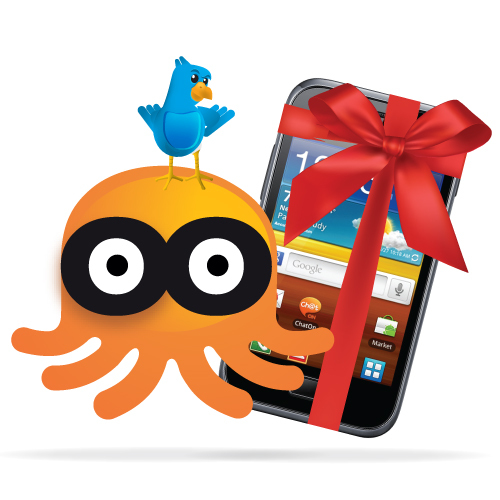 The answer that gets the highest number of retweets wins a “Samsung Galaxy Ace Plus” mobile phone. Akhtaboot – the career network is proud to announce Dina Abandah as the winner of “#AkhtabootJobFair” Twitter competition.The contest attracted hundreds of active participants from all over the Middle East. @akhtaboot followers only had to retweet one of Akhtaboot 3rd Job Fair tweets to be able to enter a random draw for their chance to win a trip for two to Sharm Al Sheikh. “#AkhtabootJobFair” Twitter competition took place during the period of November 7th and November 20th, 2012. Dina Abandah was crowned winner through a random draw that was conducted and announced on the 22nd of November, 2012 during Akhtaboot 3rd Job Fair and on all Akhtaboot’s Social media Channels including Facebook, Twitter, LinkedIn, Google+ and Pinterest. As if job interviews aren’t tough enough, hiring managers nowadays are going for weird and hard to answer interview questions that can put an A-lister in the hot seat. To being with, you must keep in mind that many of the toughest interview questions don’t necessarily have right and wrong answers. The real purpose of such questions is to find out more about the true personality of candidates when put under pressure and how they form decisions when faced with tough situations. If candidates knew the exact questions to be asked in a job interview, they will rehearse beforehand, preventing their true personality from coming out. 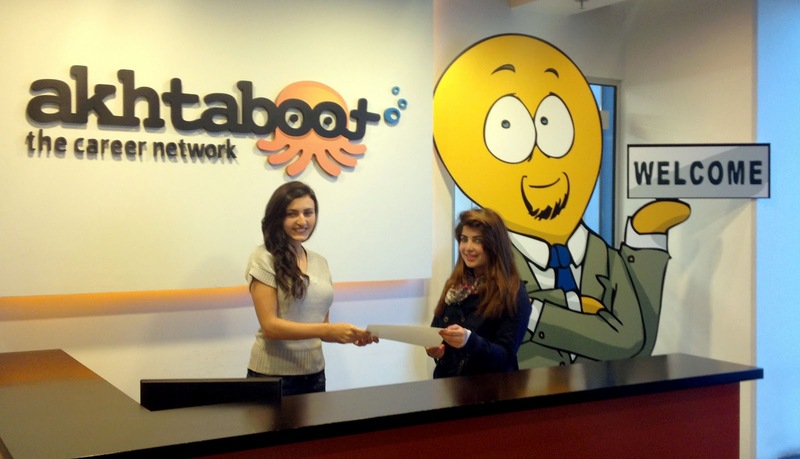 Akhtaboot – the career network is proud to announce Farah Azar as the winner of “Win an iPhone 4S with Akhtaboot” contest. The contest attracted hundreds of eager participants from all over the Middle East to share their experiences with Akhtaboot in a 45 second video talking about what they like the most about the career network. Farah was one of the 20 finalists whose videos were posted on all Akhtaboot Facebook Fan Pages for members to view and “like”, and he was announced winner after receiving the highest number of likes from fans, friends and viewers. After 3 months of anticipation, we are happy to announce the winner of Akhtaboot’s first ever video competition. 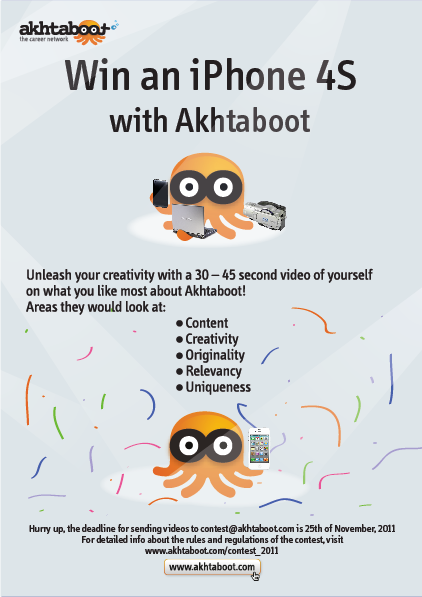 Want to Win an iPhone 4S with Akhtaboot? Akhtaboot – the career network is proud to announce the first-ever “Win an iPhone 4S with Akhtaboot” contest. All you have to do is shoot a 30 – 45 second video of yourself talking about your experience with Akhtaboot; how Akhtaboot helped you land your dream job, what do you like about Akhtaboot…etc. You can be funny, serious, talk in English, Arabic, or both… Basically, be yourself! Like one of the following Akhtaboot fan pages: Akhtaboot – The Career Network, Akhtaboot – UAE, Akhtaboot – KSA, or Akhtaboot – Egypt.